Is this offer available in Canada ??? Appears to be in the USA only. Awesome so excited for a free cone of icecream. Does this apply in Canada?? Can you get more than one say, I had my husband go get one for him, our daughter, and myself, would that be okay? And do you think they would put them into small cups for us? I think that is a wonderful idea. I think they should do it on different holiday. 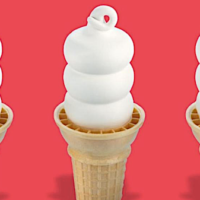 Some people can’t afford to give donation can they still get a free cone. I live in Reno I hope are are is giving away as well. Thanks u for giving us a wonderful treat.